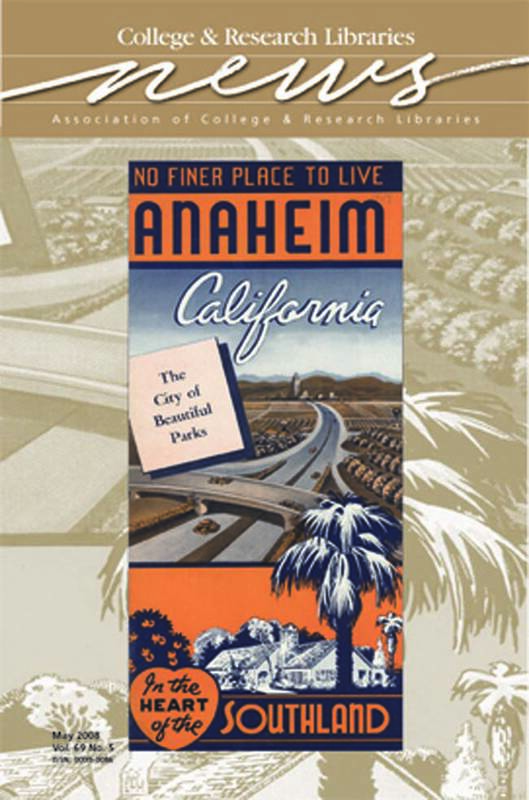 In honor of the upcoming 2008 ALA Annual Conference, this month’s cover depicts an idealized Anaheim of 60 years ago, long before Disneyland, freeways, and massive population growth. Throughout the first half of the 20th century, colorful promotional pamphlets lured Americans seeking prosperity and beauty to Southern California. Orange County was a particularly attractive destination: images of orange groves spreading from the coast to the mountains became a ubiquitous element of such advertising. Palm trees and the nearby Santa Ana Mountains added to the allure. The ad is one of thousands in the regional history collections in Special Collections and Archives at the University of California-Irvine Libraries, home to the largest institutional collection on Orange County. Visit special.lib.uci.edu for more information.